Update - Added November 30 hotfixes, including a massive boost to Gamon's already incredible power! BNET2 - Well, that's the Battle.net we now use on WoW. BNET2MapMarket - This is pretty self explanatory, but I'm a little surprised by the timeline. BNET2 3rd Parties - The end-game with Battle.net is as far as I know to compete with Steam. One of the best way to do that would be to use the new platform to distribute a popular game, and if that game was an upcoming Call of Duty title the Activision/Blizzard merge would suddenly make a lot of sense, right? WoWMobile - Done/in-progress with the mobile Auction House and the upcoming extra features. Cataclysm - Well, we all know about that. WoW X4 - 4th expansion in a year and a half sounds very plausible. WoW Movie - I'd say the timeline is off because the document is a few months old, before Sam Raimi decided to work on other projects before the Warcraft movie (but I still want to believe). WoW X5 - 5th expansion a year and a half later, nothing surprising. New Forum Titles are here! The new titles are finally deployed on the forums and I'm only a few months late! Hopefully it will make the regular forum posters happier and it will be an awesome opportunity for the 40 new moderators I will promote tomorrow to ban hundreds of people trying to boost their post count. See the list below, the post count required for the last 3 titles will remain secret for the moment, it's ridiculously high anyway. Many loot tables for NPCs have been adjusted to provide the correct items and scaling. The Alchemy bonus from Flask of Stoneskin now grants 120 stamina, up from 80 stamina, to keep it in-line with similar bonuses from other professions. Many creatures in Uldaman were not awarding reputation upon death. This has been corrected. Wrathbone Reavers, Wrathbone Sorcerers, and Fallen Warriors no longer grant reputation in Pit of Saron. Players can again start the Thrall escape event in Caverns of Time: Old Hillsbrad regardless of quest status. The temporary guardian Basalt Rockling no longer drops from Balboa in Azshara. Magma-Lord Kolob in Burning Steppes no longer awards dungeon tabard reputation. The rest area for Tarren Mill is now correctly located in the inn. Golden Skeleton Key can no longer open lockboxes that requires a higher Lockpicking skill than 125. Bronjahm should once again drop Heroic-quality loot in Heroic Forge of Souls. Random, mean level 15 deer appeared in Teldrassil to the shock and awe of low-level players. They have been replaced with level 1 fawn. Gunships in Isle of Conquest should now work properly when a member of the opposite faction is on the gunship. It is no longer possible to bypass Fatigue beyond the borders of Dun Morogh (looking at you here, death knights). All ranks of Lifeblood are correctly granting the amount of Haste listed in their tooltips and are no longer affected by max health. Ravage! is no longer consuming Clearcasting when it is used, and is only benefiting from Stampede. Trueshot Aura now functions correctly for level 39 hunters. Hunter pets that were immortal can now be killed, flying pets no longer fly, and pets that were immobile after tamed properly move. Beetle and turtle pet armor is now consistent with other Tenacity pet armor. Qiraji Scarabs from the Temple of Ahn'Qiraj are no longer able to be effected by the Mutate Bug buff after being tamed. When Freeze misses or resists on the first target, but is successful on another target, the mage will correctly get the Fingers of Frost procs from the target successfully hit. Applying a damage-over-time Fire spell to a target that is being tanked no longer causes that target to face the mage. The effect of the talent Firestarter will no longer stop functioning when Molten Armor has only 30 minutes remaining when cast with Glyph of Armors active. Hammer of the Righteous now consistently hits all nearby targets, including those behind the paladin. Hammer of the Righteous should now function correctly if used right as an auto-attack begins. Holy Word: Sanctuary was healing for too much when used with Glyph of Prayer of Healing. This has been corrected. Demon pets should not be receiving the appropriate contribution of the warlock's armor. Blood Pact is now properly scaling with the level of party members. Dungeon quests for level 1-60 dungeons on Eastern Kingdoms and Kalimdor now reward significantly less experience. Read more about this change here. Soldiers in Northwatch Foothold, Durotar now spawn more frequently. Players should no longer get disconnected if they attempt to share a quest that isn't supposed to be sharable. Players should still be able to interact with Orgus after offering a drink for the quest "Let's See What You've Got, Zanzil". Ranger Glynda Nal'shea no longer has a duplicate personality appearing in Lor'danel, Darkshore. Satchel of Helpful Goods should be rewarded when players complete Shadowfang Keep via the Looking For Dungeon system. "The Secrets of Uldum" can be completed. Margol the Rager in Searing Gorge now respawns in a much more reasonable timeframe. Plainstriders in Northern Barrens now respawn considerably faster to meet the demand of their demise. "One Draenei's Junk..." and "Kum'isha's Endeavors" can no longer be shared. The quest item Enohar's Explosive Arrows for the quest "Curtail the Darktail" can now only be used on Darktail Bonepickers within Blasted Lands. Mounted characters can now proceed through "Rise of the Brotherhood" in Westfall without any complications. Buttonwillow's Hand Grenade from the quest "Remove Their Arms" can no longer be used outside of Blasted Lands. Golems at the Grimesilt Dig Site in Searing Gorge should now respawn at a more reasonable rate. Players should no longer experience a client crash when accepting the quest "A Destiny of Flame and Sorrow". The Cataclysm has wrought changes to many facets of Azeroth and the dungeons found across the world are no exception. As many of the zones throughout the world now have new level ranges, the dungeons within their borders have been adjusted to match, and the items that drop within those dungeons have had their stats changed accordingly. If you are wearing one of the new faction tabards (e.g. Thunder Bluff, Stormwind, Orgrimmar, Ironforge, etc. ), you will only receive reputation gains for that city/faction when in Classic (1-60), Northrend (70-80), and Cataclysm (80-85) dungeons. Outland dungeons will not currently provide reputation gains for the "home city" faction you are championing; this is intended. We've enjoyed the few that have been made and really hope to continue on with them. A big issue is always time constraints, but the biggest hurdle is probably that we don't have the capability to alter spell effects directly with a glyph yet. The tech doesn't exist for us. Swapping out models, like the two you mentioned, are somewhat easy as long as we like the actual effect and want it in the game. Changing fire to be colored green though, while awesome, isn't as easy. Last edited by Boubouille; 2010-12-01 at 03:40 AM. My prediction is that SC2 Phoenix is SC1 reborn in the SC2 engine, with SC2 voice actors, etc. Possibly even SC2 design philosophies (so it won't be a redo of the missions themselves, as those were all "build base, kill base", but will do different types of missions while retaining the storyline). looks fancy, may see an emerald dream afterall. So ummmm ahhh.......whos gonna kill the kittens if u post it on Official forums or use it as a fact? So would this imply a stopping point or just a short time frame graph? Interesting piece of information indeed. mmo-c be prepared for : "NUCLEAR LAUNCH DETECTED" thats too much to leak! I feel like many of those titles are rather moot, because anyone posting over 10k times is bound to make some amazing post that gets them a custom title from a mod. Edit: Also, theres gonna be a shitstorm over keyboard turner, from the keyboard turners claiming it's just as good as binding. I personally think it's a hilariously fitting title. Last edited by Mr_Bojangles; 2010-12-01 at 03:27 AM. Edit: I mean, then again, it's not like it's surprising or hard to write up a tentative schedule. They just ask themselves "How many expansions do we want and how long should be between them?" Dev team says "2 and 1.5 years", boom, very early schedule created. Last edited by Simca; 2010-12-01 at 03:32 AM. 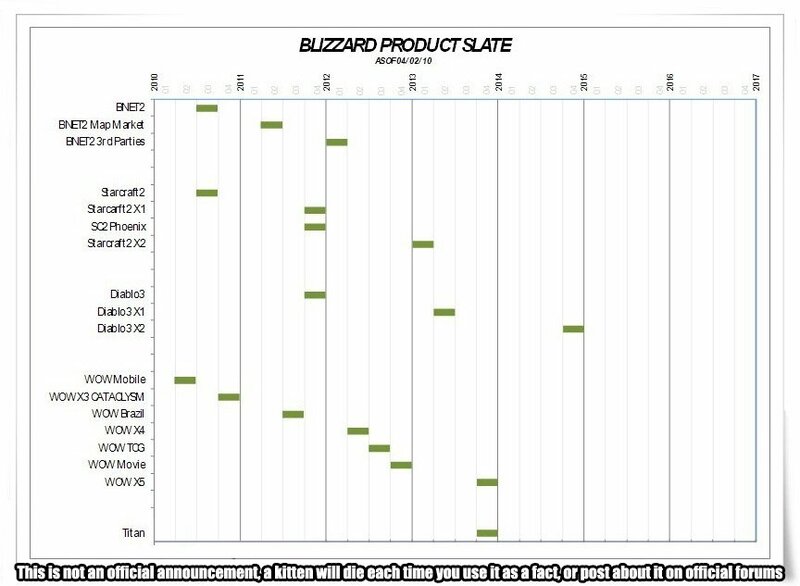 Boub you just turned this from a random picture into a new "List"
Don't forget that this schedule hasn't been applied to Blizzard time yet, so when you do the conversion, the end of 2012 is ~ 2014, and 2015 is code for 'canceled project'. I doubt Blizzard would be dumb enough to say "take it down". If they do that's pretty much confirming that it's real. Still the dates look pretty reasonable. It's not like its anything mindblowing. The number one, best part about instances is that you get a big boost. No one wants to run them 15 times an hour to break even to questing. I have never heard someone legitamitly and seriously say, 'OMG those instance quests gave me SO much exp, I am so infuriated that my orange quests from the area I was in are now yellow or green and that I might have to spend less time completing them to move on to the next zone to level up more even though I got an awesome boost from an easy instance...........whhhhhhhhhaaaaaaaaaaaaaaa?' See, even in that scenario, it's impossible for that hypothetical person to even imagine not liking the, basically, one time extra boost that instance quests give. But no. Thanks Blizz. I understand wanting to force people to view as much as your crappy new water effects by leveling as slowly as possible and having no survivability whatsoever, but can you give us a break? Maybe a 12% break?